Carmela has been a student of metaphysics, spirituality, and new thought systems since 1978. 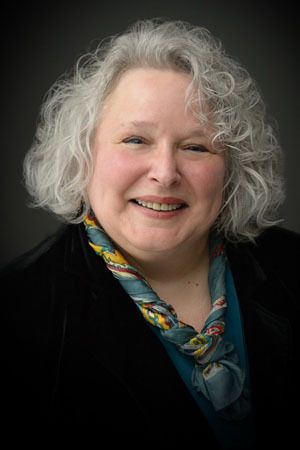 She became active as a healing practitioner in 1986, is an advanced MariEl practitioner, a Reiki Master, was a member of the practitioners group that received the Integrated Energy Therapy system of healing, and is an Integrated Energy Therapy Master Instructor. Carmela was ordained as an Interfaith Minister in 1987, and received degrees in Spiritual Counseling and Spiritual Therapy. She was an associate of the Center of Being until 1996, and has been the Director of the Divine Light Center since 1996. In 2000, Carmela became a certified hypnotherapist and added that to the already existing repertoire of services offered at the Divine Light Center. These services include Energy Therapy Sessions and Trainings, Past Life Regressions, Spiritual Counseling for individuals and couples, Numerology, Hypnotherapy, and other services such as Wedding Ceremonies, Baby Welcoming/Naming Ceremonies, Christenings, Memorial Services, Funerals, House blessings, etc. Carmela also offers classes and workshops on various subjects including A Course In Miracles which she has teaching since 1990. Carmela has also made appearances on cable TV offering inspirational messages, and was included in the 1992 Michael Apted documentary, Married in America. Carmela’s purpose and function is to empower others to take an active part in their personal healing, to help them move though any fear or blocks that may exist, thus helping them integrate into their lives the awareness of their own beauty, perfection, and Divine Oneness, resulting in a life of peace, joy, and fulfillment! In July 1999, Carmela met Rev. Dolores Vetter, founder of the then two-month-old Unity Christ Church in Boonton. Carmela supported Dolores in building Unity Christ Church by volunteering in various positions, conducting classes & workshops, and performing Sunday services as needed. In February 2001, Carmela became Acting Minister of Unity Christ Church as Dolores accompanied her son, Brian, to Houston Texas while he underwent chemotherapy. During this time Carmela also sponsored and organized UCC’s first Holistic Fair, held in September 2001. After Rev. Dolores relocated, Carmela continued to serve Unity Christ Church by filling in for Rev. Alexandra Van Horn as needed. In August 2003 as Rev. Alexandra prepared to relocate, Carmela joined with Rev. Eileen Brosko to keep Unity Christ Church alive and growing. Carmela served as Co-Minister until November 2009. 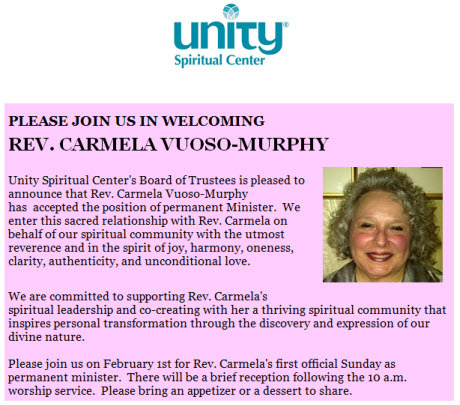 In 2015 Carmela joyfully accepted the position of Sr. Minister of Unity Spiritual Center in Asbury NJ where she continues to serve.